Practicing meditation regularly will help your overall stress levels. 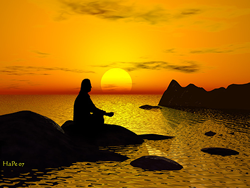 Starting your day with meditation helps you to begin your day more calmly. Ending the day with meditation allows you to wind down and relax for sleep. But the most important thing is to meditate consistently, for any length of time, no matter how short the duration. Dr. Herbert Benson discovered the link between the mind and body in the late 1960s. Benson is described in the book Body & Soul: Your Guide to Health, Happiness, and Total Well-Being by Gail Harris as “the godfather of modern mind/body medicine.” Interviewed for Harris’s book, Benson discusses how he made the connection when he noted that some patients had high blood pressure when visiting his office, but didn’t have it outside of his office. This resulted in his hypothesis that the mind could affect the body. His experiments with monkeys and then with students who practiced Transcendental Meditation resulted in six books, including his most famous one, The Relaxation Response. What Benson’s work shows is that meditation can be used when experiencing stressful situations. Benson defines stress as coming from “any situation or circumstance that requires behavioural adjustment” (Harris, 5). Benson goes on to say that even positive change results in stress, and both positive and negative stress results in hormonal changes that affect physical and mental state. He observed that there are two steps used by those practicing Transcendental Meditation common in various forms of religious and meditative practices, which help to achieve the desired relaxation response. Step one is the repetition of a word or phrase, and step two is allowing thoughts to come and go while remaining detached from those thoughts. Benson was able to train the monkeys that he experimented with using operant conditioning to manipulate their blood pressure. Using meditation incorporating the two-step process Benson outlines, it would be possible to mitigate one’s reaction to stress. Benson explains that “By the simple act of meditation, there was decreased metabolism, that is, a decreased amount of energy the body was utilizing, a decreased rate of breathing, decreased blood pressure, different brain waves, all by the simple act of changing their thinking” (Harris, 4). In addition to helping reduce stress at the time you do a meditation, practicing meditation regularly benefits you long term. According to Davis, Robbins Eshelman and McKay, in their book The Relaxation & Stress Reduction Workbook, the more consistently you practice, the more you will be able to deepen the level of relaxation achieved, the more focused your attention will become, and the better able you will be to live in the moment. The overall health benefits, according to Davis et al, are lowering of high blood pressure and the prevention or treatment of such ailments as heart disease, migraines, and a variety of autoimmune diseases, including diabetes and arthritis. It also helps with a variety of mental and emotional states including obsessive thinking, anxiety, depression, and hostility. Ideally, you should meditate both at the start of the day and at the end of the day. If you are only able to meditate once during the day, then decide which fits into your lifestyle better and which provides you with the most benefits. Each has its advantages. Some meditation CDs are structured to have a morning and an evening meditation, and these are specifically tailored to either ease you into your day or wind you down towards sleep. Meditating at the start of the day helps set your mood for the day. You start off with a more calm and positive outlook. You create a positive tone for the day. You can state an intent or goal for the day at the start of your meditation and then meditate on it. You can even ask for messages from your guides about the day and may receive warnings or premonitions about anything of which you need to be aware. This is also a good time to do a chakra meditation to align your chakras for the coming day. Chakras are energy centres in the body, with seven major chakra centres running up through the body from the crown of your head to the base of your spine. When these energy centres are not balanced, you can experience difficulties on the mental, spiritual, emotional, or physical level. Aligning them first thing in the morning by meditating helps your health on all levels. When you end the day with a meditation, you release any stress that you accumulated and ease yourself into sleep. Sometimes, it works so well that you ease yourself into sleep while you are still meditating. But that does not mean that you won’t receive the benefits of the meditation. At the very least, it verifies that you have been able to relax. As with the morning meditation, if you do a chakra clearing meditation, then you receive the benefits from daily chakra work. Doreen Virtue has a great chakra balancing meditation that contains one meditation for the morning and one for the evening, called Chakra Clearing: A Morning and Evening Meditation to Awaken Your Spiritual Power. In what has become my all-time favourite affirmation, she helps you to ease out of your day and let go of any anger you might be harbouring towards another person by thinking of that person and repeating, “I am willing to release that part of me that angers me when I think of you.” The beauty of it is that it puts the onus on you for feelings triggered by another and helps you to confront and release them in a healthy way. Meditating daily creates a healthy habit, and most people can find the time to set aside at least a few minutes to do so. The length of a meditation session is not as important as doing the meditation consistently. As Virtue says in her book I’d Change My Life If I Had More Time, “… even one minute of focused meditation yields amazing benefits. I’d rather see someone commit to having a connection with their source for one minute than sit with wandering or idle thoughts for one hour” (Virtue, 215). Harris, Gail, Body & Soul: Your Guide to Health, Happiness, and Total Well-Being, New York: Kensington Books, 1999. Virtue, Doreen, Ph.D., I’d Change My Life If I Had More Time: A Practical Guide to Making Dreams Come True, Carlsbad: Hay House Inc., 1996. Virtue, Doreen, Ph.D., Chakra Clearing: A Morning and Evening Meditation to Awaken Your Spiritual Power, Carlsbad: Hay House Inc., 1997.